Our Vonage Review gives them the proverbial two thumbs up.My experience with the customer service is awesome. Cnet seems to agree. When Vonage says it is quick and easy they are right. The benefit of Vonage.com is they provide the same or better quality phone service for less money. If you use a lot of long distance they can be much cheaper than the service you have now. Many people use their cell phone for long distance but it is often much cheaper to use Vonage. 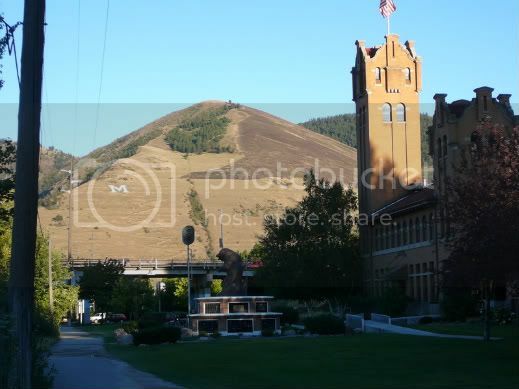 Mount Sentinel from the Kim Williams Trail in Missoula, Montana. Vonage at this time has two Residential Plans. "Premium Unlimited" offers unlimited local and long distance calling and currently costs $24.99 per month. Currently the first month is free with the unlimited service. There is a $29.99 activation fee (way cheaper than the last land line I had hooked up). Depending on where you live there will be some regulatory fees etc every month also. "Basic 500" offers 500 minutes to anywhere in the US and Canada for $14.99. Service to Puerto Rico is also included. Incoming calls are Free. After your 500 minutes per month, local or long distance, you will be charged 3.9 cents per minute. Currently there is an activation fee on this plan of $29.99 and other regulatory fees also. Vonage Review also has two Vonage.com Small Business Plans. "Small Business Premium Unlimited Plan" offers unlimited local and Long distance calling. Free Calls to some European countries, a Free Dedicated Fax line, a Free Phone adapter if you sign up Direct with Vonage. You are able to Keep your Phone number and the myriad of Vonage free benefits come along with this Unlimited plan. You can easily add more lines to this plan also. "Vonage Small Business Basic"1500 minute plan offers a free fax line, unlimited incoming minutes and 1500 outgoing minutes. Many of the other great benefits of Vonage service are free also. What is a Vonage VOIP Phone? Vonage VOIP Phone How it Works. Who can I talk to with a Voip Phone? Can I call a land line or Cell Phone or just other Vonage Phones? What Are Vonage International Phone Rates? How many countries can you Call for Free with Vonage VOIP? Different Vonage Business Plans. How to sign up for a Vonage Business Plan. Features of the Basic 1500 Business Plan and the Premium Unlimited Business Plan. How does the Vonage SoftPhone Work?